I took the trike to the Exeter VOSA station for its MSVA test, and which I have been stressing about for the last 3 months, and which didn’t quite go to plan.After an early start where we picked up a trailer for the trike, then picked up the trike itself, and finally headed over to the testing station. For us that’s a 1.5 hour drive to the west, through holiday traffic (bloody caravans), with some of the most beautiful country side you could wish to see. Once we arrived at the test centre, we met the examiner who proved to be a very nice guy, and he put me at my ease about the whole testing process. One of the first questions he asked me was whether I had read the MSVA testing manual, which I was happy to confirm I had. The examiner then proceeded to go through the manual section by section, ignoring certain parts that didn’t apply to the trike, all the while answering any questions I had about the testing process, or questions about construction. I will warn you the initial test is a long test, taking around three hours to complete, but the examiner tries to keep you informed about every step of the process. If the examiner comes across anything he is not sure about, or not seen before (as in my case), he may need to phone someone for technical advice. As it turned out my trike failed on several things including mudguard fixings, the side lights and integrated indicators (they are illegal because the white light is flashing), the master cylinder blew a seal, and a few other things. 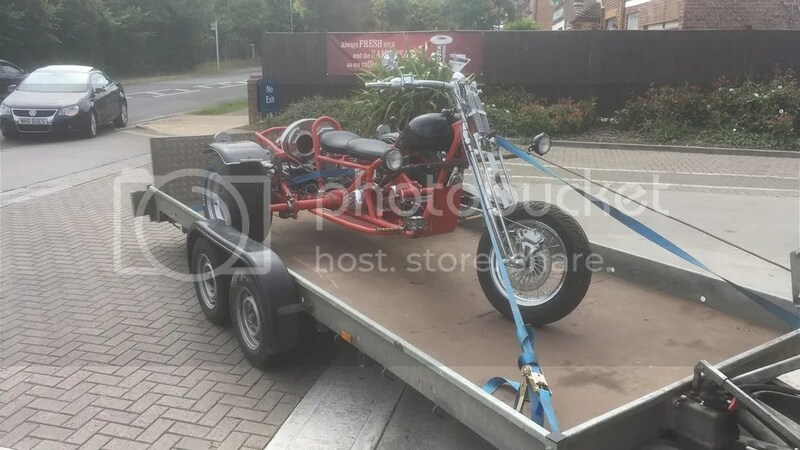 I now have 6 months to sort out all the issues and get the trike back in for retest after fixing all the issues that were found on the initial test. That Final Push – Days 5 6 and 7 Its our 2nd birthday!